Josie Walter's fascination with kitchenware is evident in her book Pots in the Kitchen, which traces the development of handmade pots for cooking as well as celebrating kitchenware made by contemporary studio pottery. ​Pots in the Kitchen is a celebration of useful pots, compiled not only as an inspiration to students, potters and collectors, but also as an encouragement to cooks, to stimulate an interest and better understanding of handmade pottery. Clay has been used to make cooking pots since the first Neolithic farmers made round bottomed pots from coils of clay for stewing food at the edges of open fires. When the coal fired range overtook the hearth as the primary heat source for cooking, potters responded by developing flat-bottomed dishes, casseroles and a whole variety of vessels for puddings and pies.This book traces the development of handmade pots used for cooking in Britain from the beginning of the 20th century, particularly describing contributions made by Bernard Leach, Michael Cardew and Ray Finch. France and French cooking has been a continual influence on British kitchens. Diables, tians, marmites and many other French pots are explained and illustrated, together with the role played by cookery writers such as Elizabeth David, who introduced French pots to the British people through her writing and her shop. Clay pots from Morocco, South America, Spain and India, casseroles, baking dishes, together with many humble pots such as cutlery drainers, colanders and lemon squeezers are all celebrated in this book. With special features illustrating potters at work, there are special sections that show how leading makers create their handmade pots in step-by-step sequences. Practical guidance is given on how to cook with handmade pottery, and for potters there is information about clay bodies and firing pots. 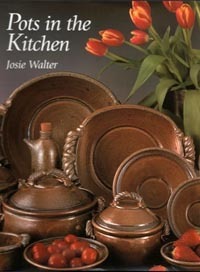 You will find some useful sources of illustrations and information about pottery made by Josie Walter in several books and magazines. 1990 The Encyclopedia of Pottery Techniques, by Peter Cosentino (Headline) pp 68, 170, 171. Slips and Slipware, by Anthony Phillips, Batsford. 1991 The Potters Dictionary, by Frank & Janet Hamer, 3rd Edition, A&C Black. 1996 Resist and Masking Techniques, by Peter Beard (A&C Black) pp75, 78-80. 1999 Slipware, by Victoria and Michael Eden (A&C Black) pp 61-3. Tableware in Clay, by Karen Wood (Crowood Press) pp 84, 126, 179. Josie is a regular contributer to Ceramic Review writing articles about pots and potters. Some of her most recent profiles of potters include Richard Godfrey and Sean Miller. 1991 'Geoffrey Fuller, Potter', Ceramics Series, Aberystwyth, No. 45. 1995 'Joanna Constantinidis', Ceramic Review, March/April, No. 152. 'Releasing the Imagination', Ceramic Review, May/June, No. 153. 1996 'Building on Tradition', Ceramic Review, Jul/Aug, No.160. 1998 'A Song of Today - Jack Doherty's Soda Fired Porcelain', Ceramic Review, May/June, No.171. 'The First Twenty Years - Phil Rogers at Home', Ceramic Review, Sept/Oct. No.173. 'Collecting, the Collection and the Collector. The Pinchen Collection of Studio Pottery' in Northern Ceramic Society Journal, Vol. 15. 'Collaboration, Rachel Barker and Andrew Brickett' in Ceramic Review, Nov/Dec, No. 180. 2000 'Einfach ein Stuck Leben leben' in Keramik Magazin, Februar/Marz. 'Below the Salt' catalogue, University of Derby. 'Looking Afresh, Anna Noel', Ceramic Review, Sept/Oct No. 185. 'Pots with a Purpose: Hafod Hill Pottery', Ceramic Review, Nov/Dec, No. 192. 'The Great Escape, Sean Miller', in Ceramic Review, May/June No. 201.